This is a micro cache, holding only a log, so please provide a pen. It is hidden close to the Kingswood Congregational Church, where my son spent many hours as a cub scout. Please retrieve and replace cache carefully. The area is prone to muggles. This cache has now been replaced with a different container. Please try to avoid being observed by people in the overlooking flats. 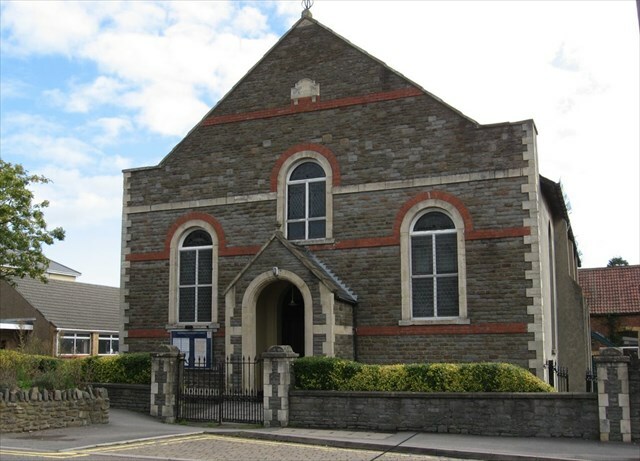 Kingswood Congregational Church, itself, traces its roots back to 1867 when some members of Whitefield's Tabernacle decided, following a disagreement over the calling of a new Minister, to create a new, independent church. Initially, these members met in houses and workshops but, in 1868, th ey acquired the site on which today's church stands. “If anybody would like to expand to this series please do, I would just ask that you could let Sadexploration know first at churchmicro@gmail.com so he can keep track of the Church numbers and names to avoid duplication. There is also a Church Micro Stats & Information page found via the Bookmark list” In 1888 the building was enlarged and in 1905, the year the balconies were added, it is recorded that 168 new members joined the church following a revival campaign. In 1911 renovation of the church took place with the pulpit being raised to its present position and the circular choir seats added. In its early days, tracts were distributed, over a two mile radius, from the church every Sunday. During the 1920's a Literary and Debating Society was extremely popular and in more recent times a drama group, supported by some members of our current church family, produced some memorable theatrical evenings.